Aren’t we just spoiled rotten in Melbourne when it comes to design? There are so many beautiful showrooms and amazing design and interior design studios thriving in our city, each one offering bundles of inspiration for anyone working in the industry. And it got me thinking… why not organise a tour for designers to visit these great design spaces as a group? So that’s exactly what I did. Designers joined us from Melbourne, Perth, Sydney, Brisbane and even as far as New Zealand, and we all hopped onto our little tour bus to begin our adventure – but not before picking up some all-important coffees from Abacus, our local cafe on Chapel Street. Right from the start of our trip, the energy was really special. It's essential to get out there and experience the pieces that we specify. This Theia lamp by Msrset is a firm favorite, the shade can swivel over the globe to adjust the light output. It's so clever and beautiful. Ajar features Spanish design in their gorgeous new-ish showroom. The first stop was Ajar’s showroom, where Andrew and his wonderful team showed us around. Everyone seemed to fall in love with something different, and for me it was the exquisite Theia Floor Lamp with its swivelling shade. For Sandy, one of our designers on tour, it was the luxurious Marlow Sofa in a rich mustard velvet that won her heart. 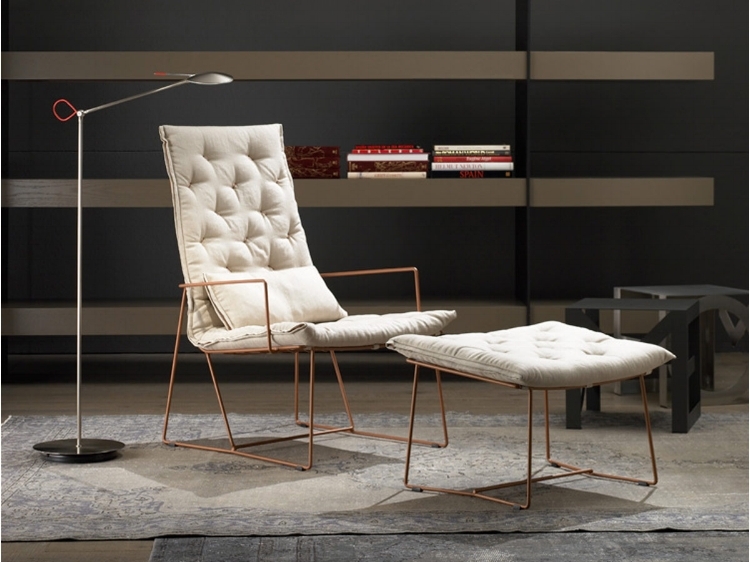 Impossible to choose a favorite from Ajar, but this Syrma armchair is up there. It's cushioned and comfortable, but not heavy. At Interstudio, Michele and Laura surprised us with the glorious sound of a champagne bottle popping as soon as we walked in – needless to say, that went down a treat with the whole group! For me, Interstudio is one of those hidden gems. I first met them about ten years ago when we worked on commercial interiors together, and it’s fascinating to see how their studio has developed since. The group were treated to lunch at Interstudio. It was just delicious, thank you! I loved their Danish brand Skagerak and Norwegian brand Hag, and it was great to be able to introduce the tour group to designers and designs they hadn’t come across before. When Michele treated us to a delicious lunch, it was really the cherry on top and we felt royally looked after! The Vent Stool by Skagerak has a braided paper cord seat, it's just beautiful. It's my favorite brand at Interstudio. The quote of the day came from Anna at the Fred International apartment, when she remarked, “My soul is on fire!” It was something we could all feel and quickly felt was a fitting summary of the entire experience. There is beauty in every single inch of the apartment – to the point where it was a little overwhelming! If you haven’t been there, make an appointment and just go. A special thanks to Melissa for your warm welcome and for opening up your stunning space. Here is Anna, when her 'soul was on fire' at Fred International. It was just the best to have you join us Anna,all the way from New Zealand! The highlight of the whole day for me was visiting the Mim Design Studio. We were all on our best behaviour as we were shown around the prestigious and well-renowned interior design studio by Mim herself. Seeing the talented team working away, the shelves packed with high-end materials and the portfolio of projects they have accomplished was entirely inspirational. It was a rare opportunity to gain valuable insight into how Australia’s top interior design practice works and, as a group, we felt endlessly privileged and thankful for Mim’s generous hospitality. I wrote more about it here. Our next stop was Domo in Sandringham. Anna and Eliza greeted us at the door and before we knew it we all had champagne glasses in our hands again. The showroom was spacious with a little something for everyone, boasting a range of interior design styles spanning across traditional, rich and luxurious, Hamptons and contemporary. The Ligne Roset collection is a firm favourite of mine and it’s always hard to resist lounging in their inviting and extremely comfortable seating. At the end, we all walked away with a goodie bag which happily included chocolate. What a treat. Thank you Anna and Eliza! Here is our group of legendary designers at Domo. Thank you for the gorgeous champagne! Last but definitely not least was the powerhouse that is Grazia of Grazia & Co. A few designers in our group had worked with them previously but had never had the chance to visit. So, we were all very excited to see the gorgeous pieces that we had admired so much in person. Safe to say we were not disappointed! Grazia, who knows just about everyone in the industry, gave us her time and talked about the incredible designers that she has worked with including Mim, Mardi Doherty, Clare Cousins, Russel & George and the latest collaborator, Techne. All the pieces are all locally made, which can be something of a rarity these days, and it’s incredibly important that we value and appreciate this so that skills including cabinetmaking and upholstering remain alive in Australia. If you’re looking to meet an inspirational furniture supplier who is truly looking after our industry, make an appointment and visit the showroom. We were lucky to get a preview on the latest range by Teche at Grazia & Co. It takes time to ensure that every detail is resolved before they take a new product into production. And it shows, the attention to detail is amazing. You might think that we’d have had enough design by this stage, but we just couldn’t get enough! Our next destination was the launch of Jardan’s Art House Collection. Obviously, we were ready for more champagne. It was a fabulous event and the showroom looked so different. With the itinerary complete and our heads and hearts filled with design, we made our way to Baby, one of our favourite Richmond restaurants, to reflect on a very busy but truly wonderful day. We all agreed that we would look back on the tour with fond memories and walk away with a fistful of inspiration to take to the drawing board – and a few new like-minded designers to call our friends. A huge thank you to all of the wonderful suppliers – Ajar, Interstudio, Fred International, Mim Design, Domo and Grazia & Co – for your time and warm hospitality. We felt like VIPs all day long and are so appreciative of the knowledge you shared and the experience you delivered. If you would like to join our next tour, see the Sessions page.